The world’s first quintilingual book has premiered — that is, a book that’s written in five languages at once. 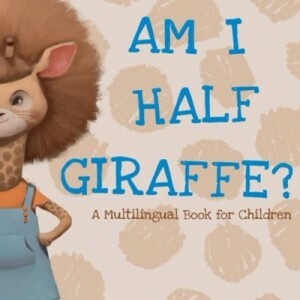 It’s called Am I Half Giraffe?, written by Dr. Jungmiwha Bullock and illustrated by Christopher Matthews. Here’s the press release: “Am I Half Giraffe? debuts globally on Lexique Du Monde Press as the first quintilingual book on the children’s book market — five languages, one book, one diverse story. It speaks to the childhood experiences that most children confront about their identities, especially among those who are ever questioned about ‘being different’. It touches on the subtle forms of bullying with regard to diversity, while at the same time teaches a powerful message that the main protagonist in the book figures out.” That protagonist is a young girl whose father is a lion and whose mother is a giraffe — and who must learn to deal with what her fellow school-kids think about that. Find out more about the genesis of this book, and where to find it, at the official web site.